Why should I purchase MarketSpace leads when I can get free referrals? MarketSpace leads are already prequalified. That means you will have all the information needed to complete the sale, including any required documentation. This saves you valuable time which can be used to generate more sales. If your leads are scheduled to close in 30 days or less and if you are also uploading leads, compensation from uploading leads will help offset the price of leads you purchase on MarketSpace. Can I invite others to join MarketSpace? Yes. An ‘invite’ button is on the MarketSpace website and inside the MarketSpace platform. We encourage you to invite as many people as you would like. Does MarketSpace sell products and services? No. MarketSpace facilitates the sell of products and the lead management process by which products and services are sold. This includes enhancing lead integrity, explicitly qualification, matching lead with customer and closing on sell of lead. Can I load a lead into MarketSpace without any information about what the customer wants? No. MarketSpace was created to prevent this specific thing from happening. Too many businesses waste valuable time and money chasing bad leads that never go anywhere. What information should I gather for a lead I want to upload? MarketSpace will automatically prompt you for the information needed to complete the lead form. You simply provide the information or request the information from your client, customer or colleague. Can I upload a lead if the person is not ready to purchase until 60+ days later? Yes. Leads with various closing dates can be uploaded to the system at any time because the MarketSpace platform is a fully functional CRM system. However, there are system constraints applied to ensure lead integrity and closing requirements for specific lead types. Direct leads (leads you are going to work internally) can be uploaded with a close date beyond 60 days and closed within your discretion. Leads that have closing dates greater than 30 days can be uploaded but will not be made visible to others using MarketSpace. Nor will the lead be available to Exchange partners until the date is within a 30 day window. The goal of MarketSpace is to work with leads that close within a 30 day window. Can any business sign up on MarketSpace? Are there specific regulations for industries? Yes, any type of business can sign up on MarketSpace. (Reminder: MarketSpace is a lead exchange platform and does not sell products or services. This is in place to safeguard MarketSpace and it’s users from exposure to regulations that apply to the selling of actual products and services). Is it possible to upload a lead and not be compensated for it? Yes. You are not obligated to accept compensation for leads that you upload in MarketSpace. In lieu of payment, you have the option to discount the item you uploaded, donate the proceeds or reject the compensation all together. Where does the compensation go if I reject it? MarketSpace retains the compensation and donates it to a charity of your choice. (This option is subject to change. Details will be given if a change occurs). How do I create a lead incentive program on MarketSpace? Offer your current customers our MarketSpace debit card. When someone refers or uploads a lead on MarketSpace, he/she will be compensated when the lead converts to a paying customer. How do I find my perfect customer on MarketSpace? Step 3. Click on the specific lead (example: financial planning, payroll, etc). Does MarketSpace charge storage fees? We provide space for document storage to each MarketSpace subscriber. The amount of space provided is defined within the licensing agreement. Additional storage may be purchased as an add-on. Please see MarketSpace ‘subscription details’ for additional information on storage allocations. Using MarketSpace results in better qualified leads, a higher lead conversion ratio and lower cost for business owners. 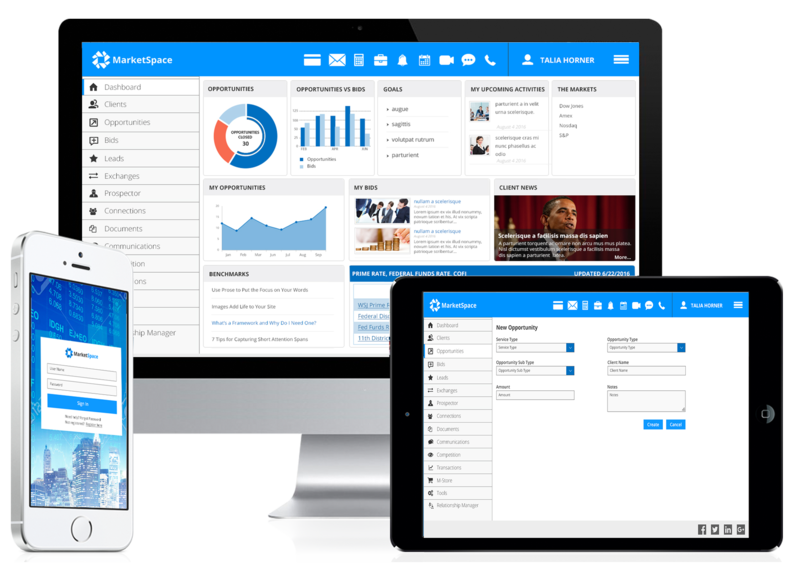 In essence, MarketSpace allows businesses to create their own leads and eliminates the high cost of business acquisitions. Why am I being charged if using MarketSpace is free? The Basic version of MarketSpace is free to use, which includes unlimited lead uploads, CRM, communications platform, and sales incentive debit cards. However, when $5000+ per month is generated in proposals (purchasing or downloading leads), the Silver package user fee is triggered. Please contact us at 704-926-2013 for all package pricing. How do I create an exchange partner on MarketSpace? Locate the person with whom you would like to do business and invite him/her onto MarketSpace, if he/she is not already on the platform. Then go to Relationship Manager on the MarketSpace tool bar (left side of webpage) and upload your exchange document(s) (agreement(s) to exchange leads). If you don’t have an exchange agreement, you can become exchange partners just by being a MarketSpace subscriber. How can I be assured that my exchange partner will not steal my customers? You should select partners that we call ‘business compliments’. These are exchange partners who do not sell the same products and/or services that you sell. MarketSpace users are expressly prohibited from usurping, selling or engaging in any behaviors that result in the failure or hindrance of another customer’s sales. Any violation of this regulation will result in the perpetrator having all MarketSpace system privileges terminated. Do you charge for the MarketSpace CRM? No, the CRM is free to use. You may also use it as your free customer relationship management system. Can clients schedule appointments on my MarketSpace calendar? No, currently appointments cannot be scheduled. However, the ability to schedule appointments directly on your MarketSpace calendar will be available soon and will be announced at that time. Does MarketSpace charge a fee to use the communication tools (i.e. chat, instant message, email, and calendar)? No, the Basic version of MarketSpace is free and the communication tools are included. Does MarketSpace charge a fee to use debit cards? MarketSpace does not charge a fee, but our payment provider does charge a nominal fee to load the cards. Please contact MarketSpace at 704-926-2013 for more information on debit card fees. Does MarketSpace offer an enterprise package for businesses? MarketSpace offers businesses the following enterprise packages: Silver, Gold and Platinum. We also offer a Basic plan that allows free access to the platform. Please contact us at 704-926-2013 for enterprise package pricing or go to www.marketspaceusa.com for subscription details. Does MarketSpace charge per user? Yes. The MarketSpace license covers only one user per subscription. Please contact us at 704-926-2013 for additional user rates.